Indeed, Renault is the first automaker to bring a full-size home to a car show, but it goes a long way to proving a point. The Symbioz project brought together “designers and engineers, academics and architects, startups and sociologues,” all in the name of finding out how to make the most of upcoming technologies. Interested in learning how your car could become an integral part of the Internet of Things? Read on for the details. Continue reading to learn more about the Renault Symbioz. Let’s start with the basics. 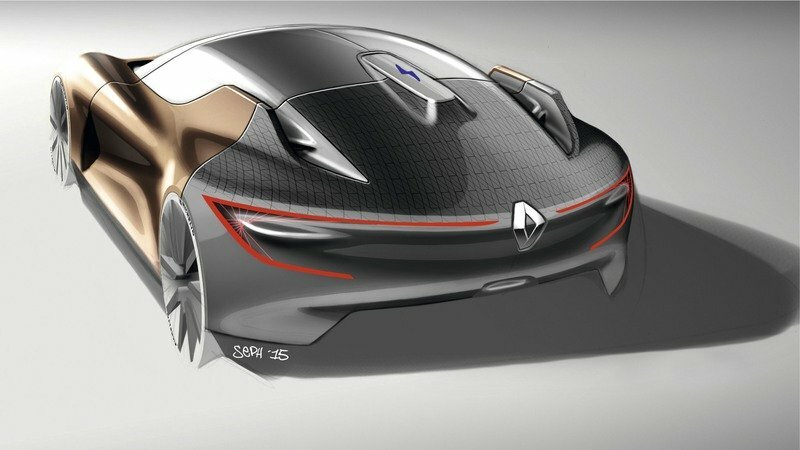 The Renault Symbioz is decently large when it comes to exterior dimensions, measuring in at 4.7 meters (185 inches) in length, 1.98 meters (78 inches) in width, and 1.35 meters (53.1 inches) in height. Finding the right balance is important here, as anything too large would take up too much space inside the home, while anything too small would be unusable as a modular room. 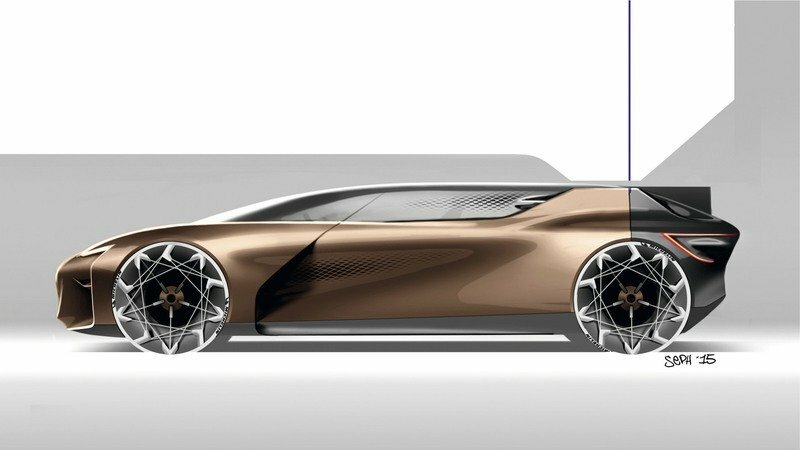 The styling is undoubtedly quite futuristic and slick looking, and comes divided between a floating top and a more muscular lower half. The body panels are made from carbon fiber, as you’d probably expect, while the paint color is a dual shade of copper, with both a matte finish and glossy finish utilized. 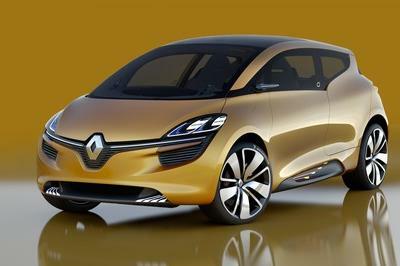 These colors are repeated elsewhere in the concept, including in the model home Renault brought to Frankfurt. 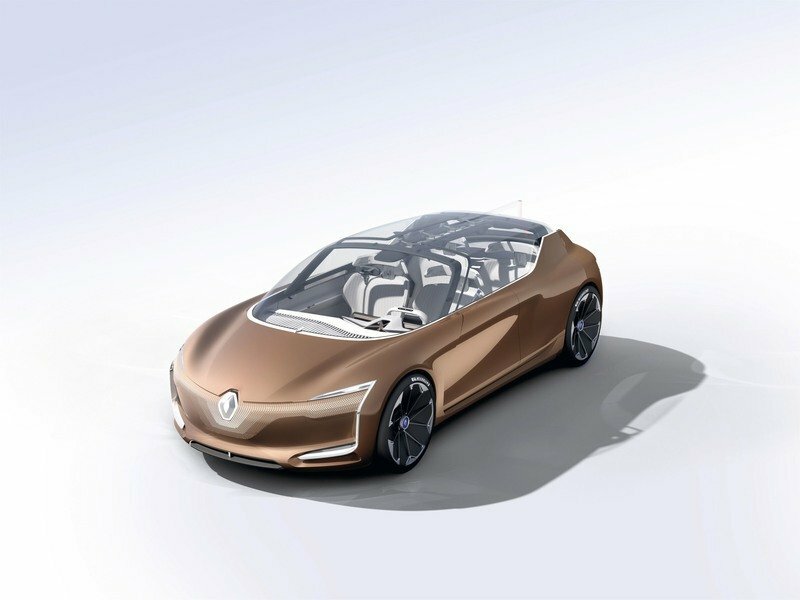 The paint color is a dual shade of copper, with both a matte finish and glossy finish utilized, colors that are repeated in the model home Renault brought to Frankfurt. Further exterior features include C-shaped headlights and taillights, both of which are used as an allusion to Renault’s current crop of production vehicles. The taillights get a dynamic lighting effects with “small lit fins” that indicate how hard the car is braking, while the aerodynamic rear wing deflector on the back of the roof gets unique graphics that stretch into the fog lights under the bumper. Various logos and badges illuminate to signal when the car is operating in autonomous driving mode. You can’t talk about the Symbioz in isolation, which means we’ve gotta mention the house that goes with it. The exterior dimensions, for example, are nothing to sneeze at, measuring in with as much as 120 square meters (1,292 square feet) of floorspace. But of course, you can’t talk about the Symbioz in isolation, which means we’ve gotta mention the house that goes with it. 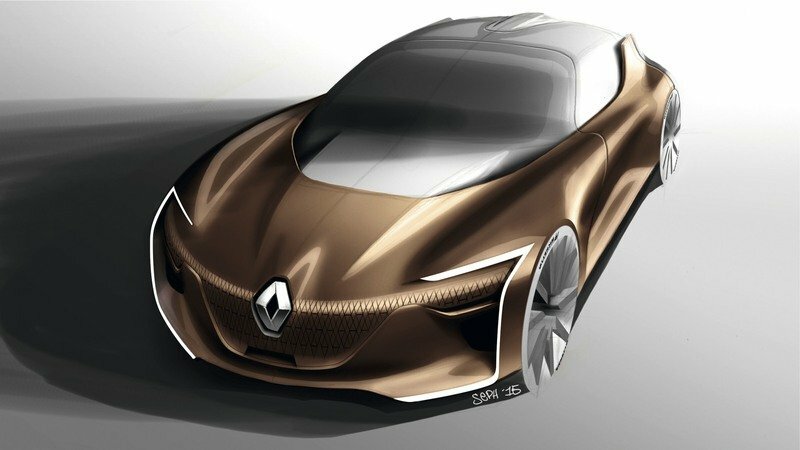 Renault did an impressive job with this – the exterior dimensions, for example, are nothing to sneeze at. The length is 21 meters (68.9 feet), the height is 7 meters (23 feet), and the width is 8 meters (26.2 feet, providing as much as 120 square meters (1,292 square feet) of floorspace. Taking responsibility for the design is the award-winning Marchi Architectes, while various prominent French designers created the furniture and home features. 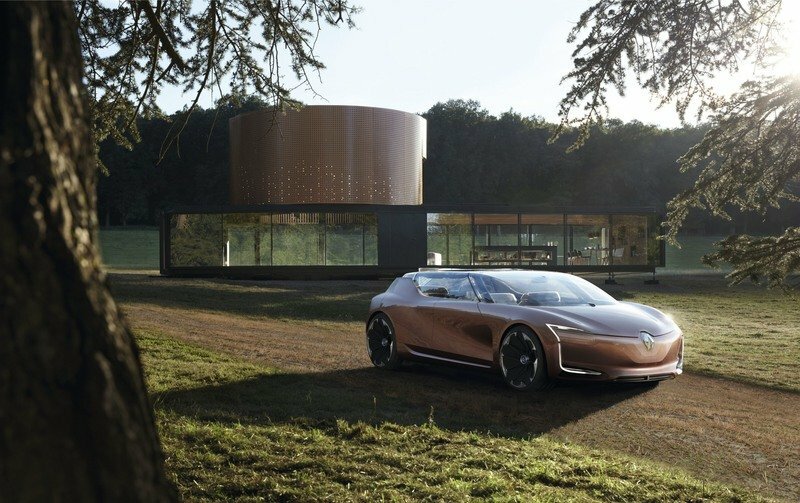 As an extension of the home, the Symbioz concept car shares several attributes with the model house. Aesthetically speaking, the colors are similar, while materials and construction include a steel frame, glazed surfaces, and wooden décor. Further shared materials include copper, marble, fabric, and porcelain, and there are plenty of open, transparent surfaces to maximize lighting inside the home. The artificial lighting inside the home also provides insight into the various car modes, such as when the car is charging, when the car is approaching the house, standby mode, and so forth. Getting in and out of the car is made easier thanks to doors that car split open and slide towards the front and back. There’s no B-pillar, which makes it even easier to fall into the cabin space, thus making it feel more like a real room in your home, rather than a car. In terms of space, Renault says the Symbioz concept “boasts D-segment dimensions, however, the vehicles spacious modular cabin design is worthy of that of an E-segment model.” This extra space is enhanced thanks to the lack of a transmission tunnel, as well as a customizable layout. The cabin takes inspiration from living room design, even coming with the same materials and furnishings that you might find in a house. 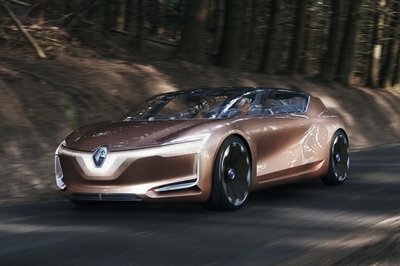 Renault adds that, “The aim is to travel in a bright, fengshui space that is much like a large living room in a house, with wide glazed contours.” As such, the cabin takes inspiration from living room design, even coming with the same materials and furnishings that you might find in a house. 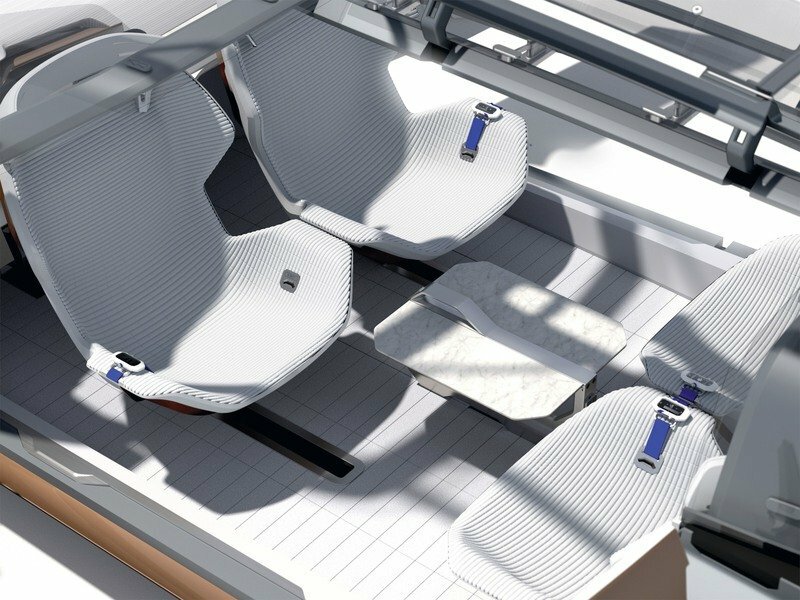 The seats pivot around for increased sociability, and if you put the car into autonomous mode, the pedals, steering wheel, and steering column fold out of the way, enhancing space even further. A marble table will even pop out between the seats, which Renault added as an allusion to the first-gen Espace from the ‘80s. The custom car seat fabric is identical to the upholstery you might find on a sofa, while the windows are made from glass and plastic, and like the house, were designed for an abundance of ambient lighting to enter the cabin. The technology, as you might expect, is pretty top-notch. Passengers are identified by the onboard system as soon as they sit down, after which various features are configured to the user’s preference. The Wi-Fi connection helps the infotainment system integrate with the user’s digital life, including the social networks, music, digital subscriptions, and ebooks. You can even work remotely and telecommute, if desired. The Wi-Fi connection helps the infotainment system integrate with the user’s digital life, including the social networks, music, digital subscriptions, and ebooks. You can even work remotely and telecommute, if desired. A high-definition OLED (Organic Light-Emitting Diode) display is mounted in an easily viewable location, and measures in at 80 cm (31.5 inches) in length. 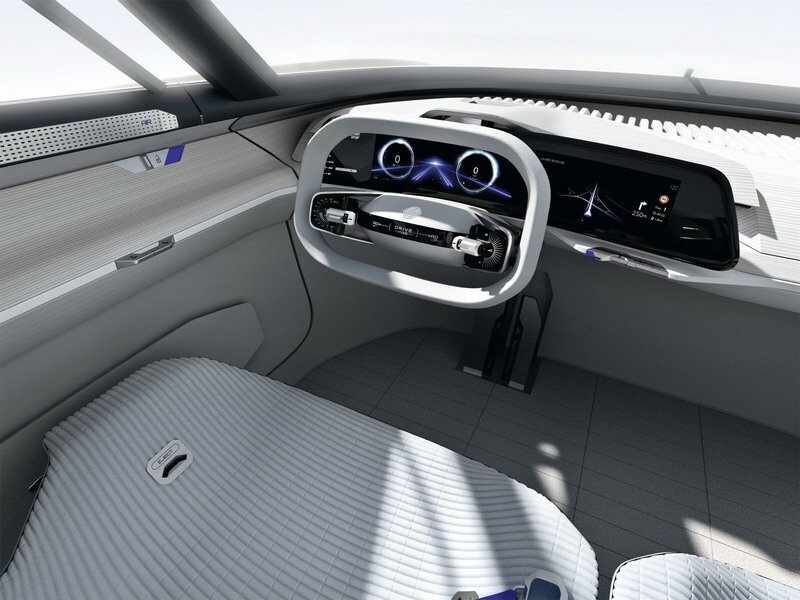 The screen is used for the various onboard infotainment systems, but is complemented by wristwatch-sized touchscreens mounted into the seat belts that enable individual control of the comfort features and entertainment. 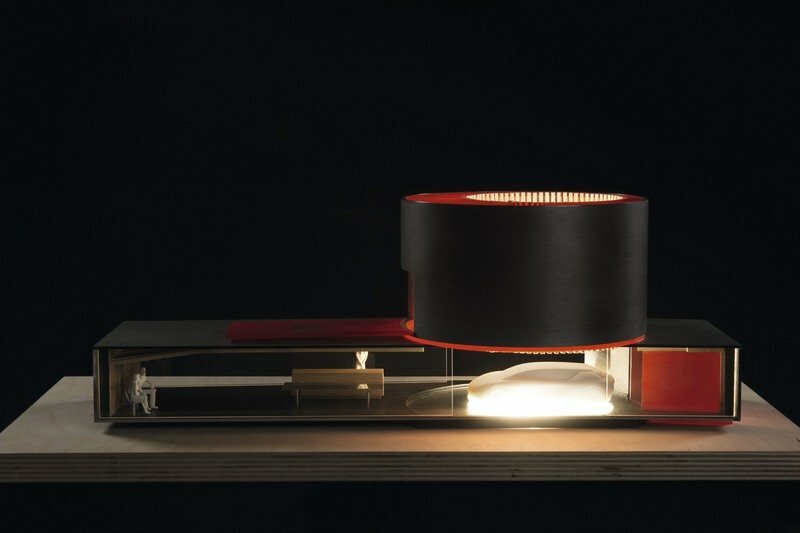 A Multi-Sense 3.0 system pumps in fragrances, music and ambient noise, and sets the lighting, all of which is customizable. There are multiple modes for the interior, with a focus on comfort, driving dynamics, or autonomous driving, as desired by the occupants. These are selectable from the steering wheel, and adjust the cabin layout, driving settings, and more. 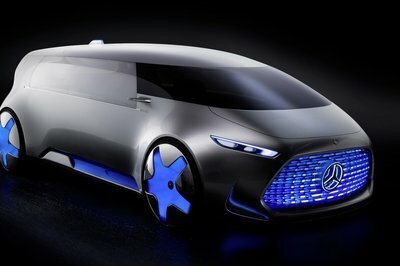 There are multiple modes for the autonomous driving experience as well, including modes for driving alone, driving with other passengers, or simply to kick back and enjoy some multimedia entertainment. 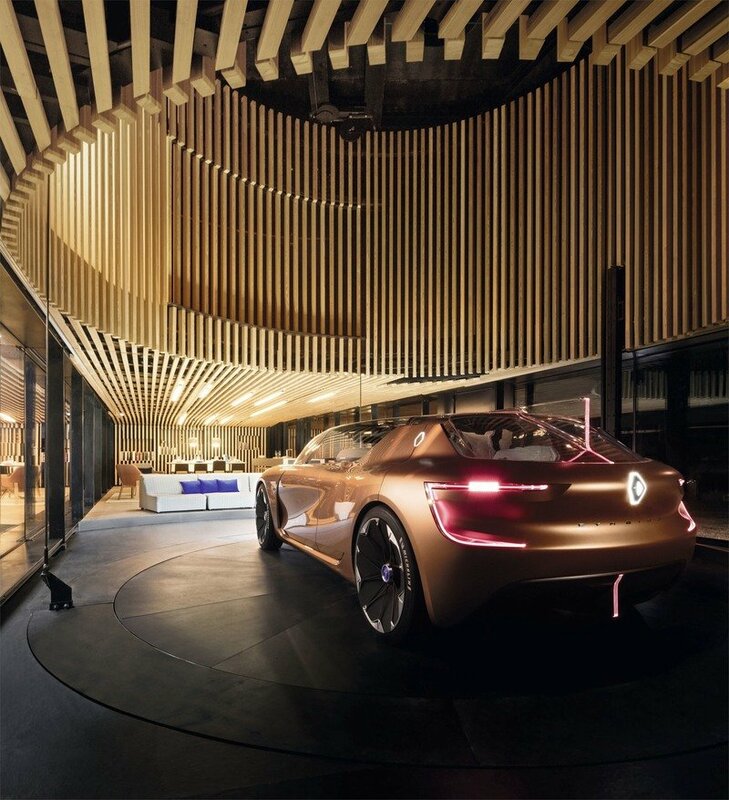 To demonstrate how the Symbioz could offer all these features in several locations within the home, Renault installed a lift in the model house that takes the car to higher levels in order to meet the user’s needs. 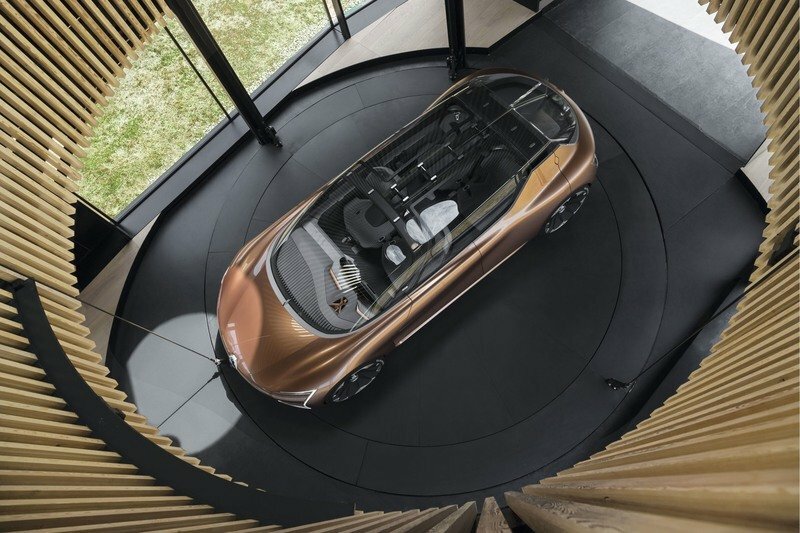 To demonstrate how the Symbioz could offer all these features in several locations within the home, Renault installed a lift in the model house that takes the car to higher levels in order to meet the user’s needs. For example, if you need a room for socializing on the roof, just hit a button, and four cables lift the parked car up a level. Further integration includes the smart use of electricity thanks to an AI that can manage how the electricity is used for greater efficiency. For example, the Symbioz will control various household objects, such as the home lighting, multimedia, and climate control. If you leave on a long trip, the car will notify the house to close the shutters and turn off the heat. Safety and convenience are upped thanks to various car-to-x and car-to-car features, which include paying tolls, avoiding traffic, and more. As previously stated, all of these autonomous systems require no human inputs at all, and are adaptable to a variety of driving environments. 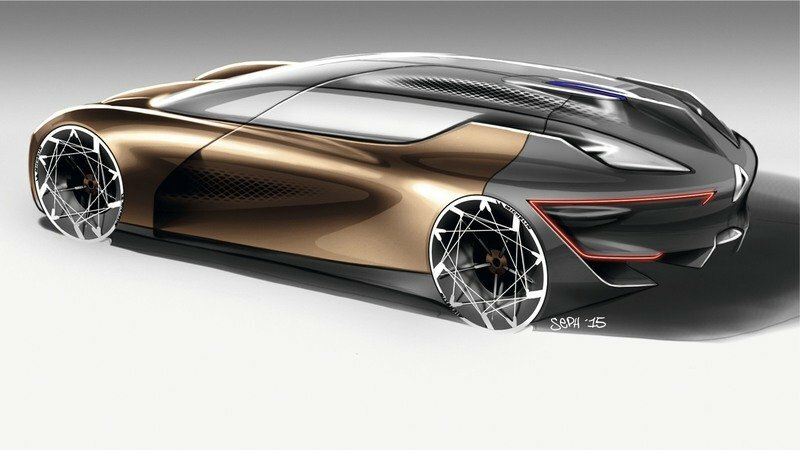 Renault says to expect production versions of the technology to be rolled out under the “Easy Drive” name some time in the future. Providing the go in the Symbioz is an extensive all-electric powertrain, which utilizes a duo of permanent-magnet electric motors on the rear axle, with one motor driving one of the wheels. Variable torque levels ensure optimum handling characteristics, while the RWD configuration helps underline the Symbioz as a relatively sporty driving experience. The RWD also opens up more space in the cabin. Power is rated at 500 kW (670 horsepower), while torque is rated at 660 Nm (487 pound-feet). 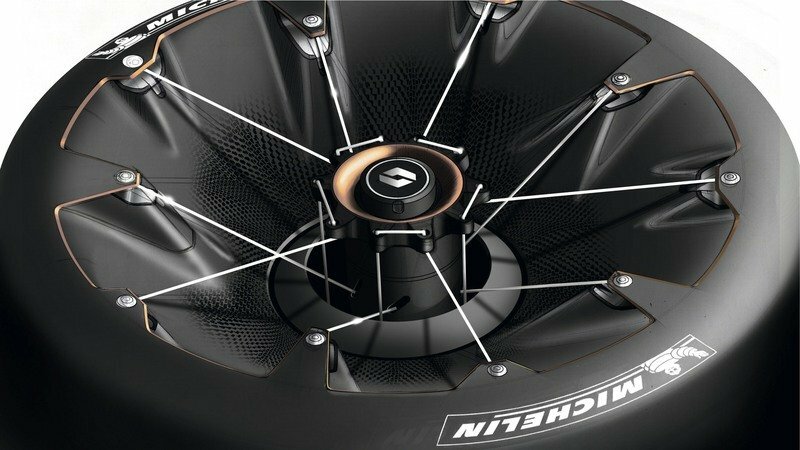 That’s a solid amount of power, and although you might expect Renault to make some crazy claim about lightening-fast acceleration numbers, the figures are actually rather conservative – the 0-to-62 mph sprint, for example, is done in less than 6 seconds. In all honesty, that sounds about right, because even with nearly 700 horsepower, a car that gets a pop-up marble table is probably pretty damn heavy. Power is rated at 670 horsepower, while torque is rated at 487 pound-feet. That’s a solid amount of power, and although you might expect Renault to make some crazy claim about lightening-fast acceleration numbers, the figures are actually rather conservative. 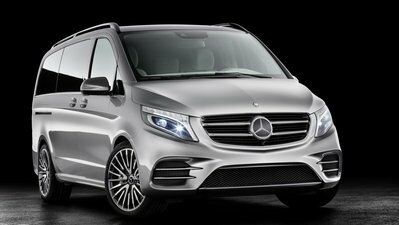 Range per charge is 500 km (311 miles), while the battery capacity is rated at 72 kWh. Renault says you’ll get as much as an 80 percent change in 20 minutes via inductive charging. 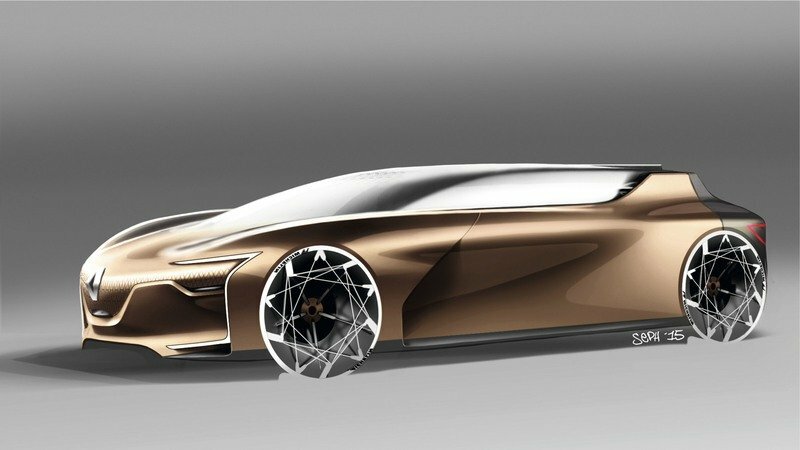 Of course, these numbers represent projected improvements Renault foresees by the year 2030, so don’t expect the same sort of efficiency with the next product cycle for modern EV’s. Back to the integration the Symbioz enjoys with the home. If there is no forthcoming trip planned, the smart energy grid will elect to keep a minimal charge in the car – enough for a short trip if needed, but not the full 311 miles. Conversely, if a trip is planned, more power will be sent to the car’s battery, while home features like central heating will get turned down. All of it is in the name of greater electric efficiency. If there is no forthcoming trip planned, the smart energy grid will elect to keep a minimal charge in the car. Conversely, if a long trip is planned, more power will be sent to the car’s battery, while home features like central heating will get turned down. The onboard electric power will also be used to power the home during peak hours to reduce cost, or as a backup generator if the power goes out. Of course, power distribution can be programmed and customized, either through systems in the car, or in the home. Finally, low rolling resistance tires are used for maximum efficiency. 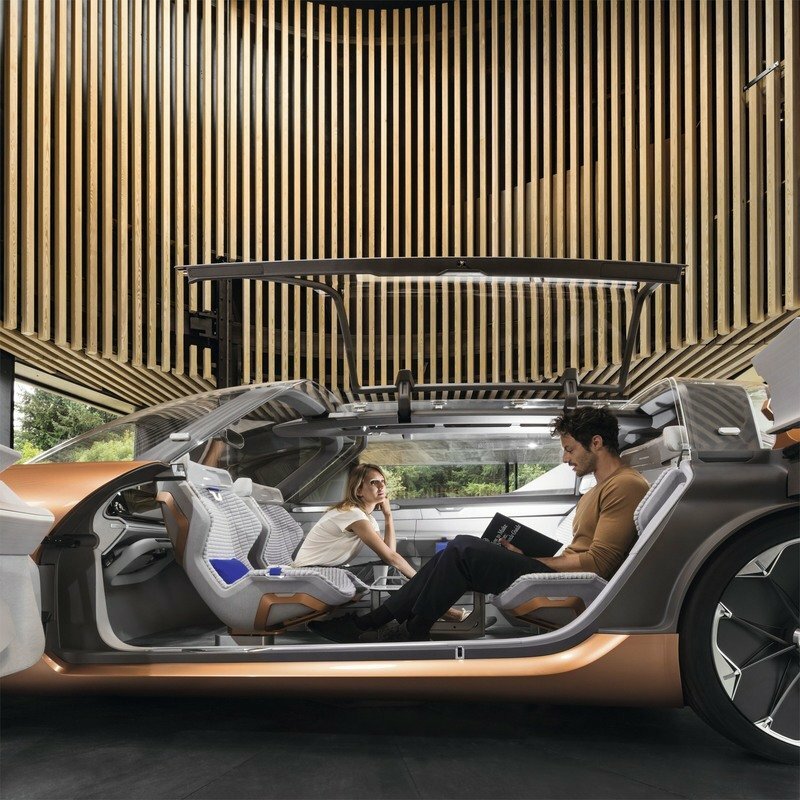 There are many automakers out there vying to shape a future where the automobile becomes more than just a means of transportation, but the Symbioz is one of the few concepts that actually manages to bring new and innovative ideas to the table. 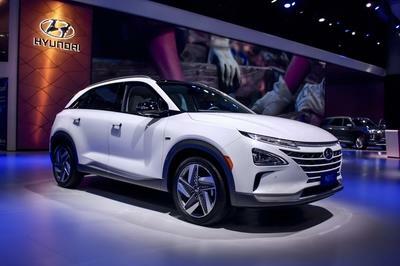 Indeed, there are many automakers out there vying to shape a future where the automobile becomes more than just a means of transportation, but the Symbioz is one of the few concepts that actually manages to bring new and innovative ideas to the table. 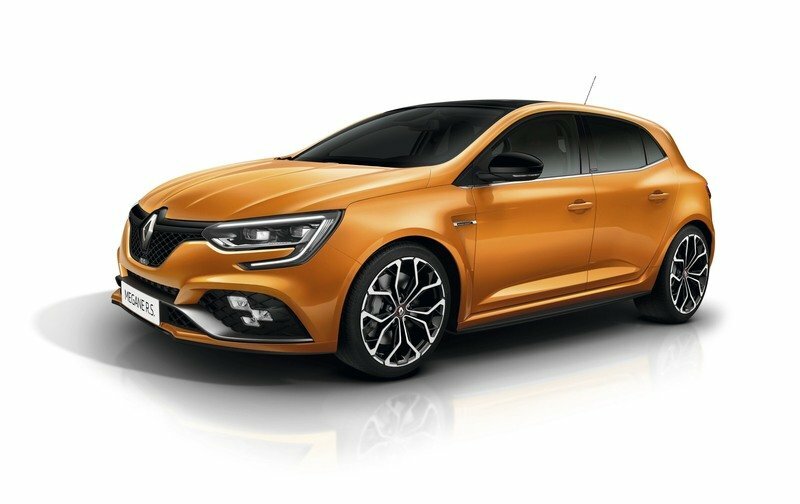 Granted, the viability of these ideas is a bit questionable at times, but it’s refreshing to see Renault taking such a holistic approach. Not only that, but a lot of these features are very pretty to look at, and credit should be given where credit is due. Will we see something like the Symbioz put into production in the future? We’ll have to wait to find out, but either way, the future is looking pretty bright. Do you really want to use your car as a room? 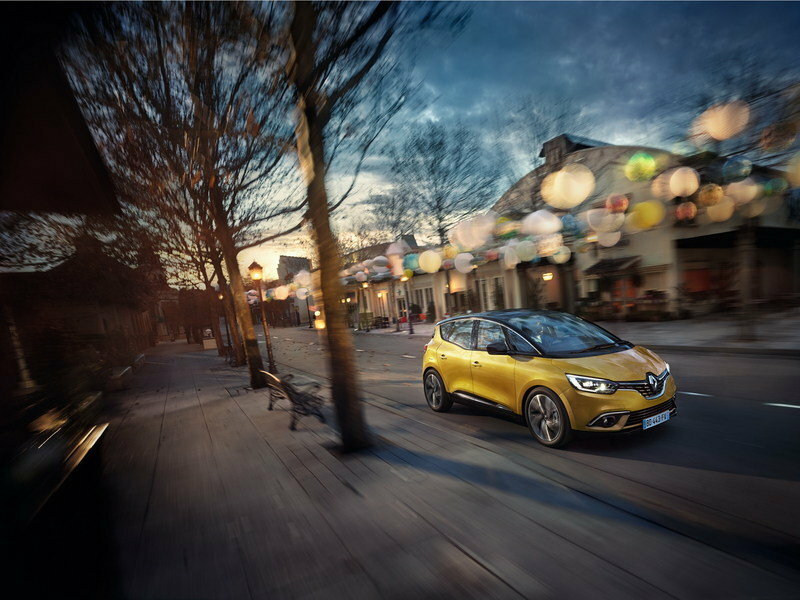 Read our full review on the Renault Scenic.